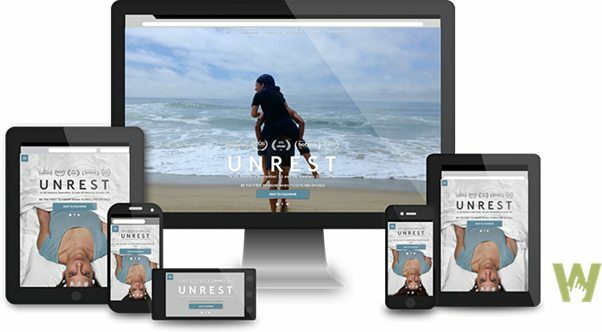 Los Angeles, CA (December 12, 2017) – Powster, the global leader in film distribution marketing websites and a leading creative studio helping to connect movie studios and moviegoers, has launched the official movie platform for “Unrest” to support the filmmaking team, promote the movie and increase ticket sales. Powster, located in London and Los Angeles, is a Vista Group International company (NZX & ASX: VGL) and a 2018 In-Kind Supporter of Sundance Institute. As “Unrest’s” official movie platform, Powster’s Showtimes Platform allows users to search for theaters and find movie showtimes for “Unrest” across the whole of the U.S. and internationally. The platform is totally responsive across desktop and mobile devices. By working with “Unrest,” a Sundance Institute Creative Distribution Fellowship recipient, Powster is encouraging data transparency within the industry. The Powster Showtimes Platform tool will be featured in a case study developed by Sundance Institute. Powster’s ultimate goal is to encourage filmmakers to learn more about their audiences to help them better understand the trajectory of their career. The platform is totally responsive across desktop and mobile devices, and used by all six major movie studios as well as over 70 independent distributors. In this moving tale of love and loss, newlyweds Jennifer and Omar search for answers as they face unexpected obstacles with great heart. Often confined by her illness to the private space of her bed, Jen is moved to connect with others around the globe. Utilizing Skype, she unlocks a forgotten community with intimate portraits of four other families suffering similarly. Director Jennifer Brea’s wonderfully honest portrayal asks us to rethink the stigma around an illness that affects millions of people. “Unrest” is a vulnerable and eloquent personal documentary that is sure to hit closer to home than many could imagine. Powster, a Vista Group (NZX & ASX: VGL) company, is a creative and innovation studio operating in London and Los Angeles. The business provides creative services to the film and music industry and creates products to help engage users with entertainment content. The global leader in film distribution marketing websites, Powster creates more than 100 destinations a month for 70+ movie distributors in over 40 countries. The Powster movie platform enables over five million consumers a week to discover cinema show times on official movie websites. Powster is modernizing how movies are marketed and delivering innovation to digital entertainment content.